When designing outdoor living spaces, furniture is just one part of the equation. Patio decor plays just as important a role (if not more so) in creating a “room” that feels homey, functional and stylish. Let’s start with wall art. It’s not just for inside the home, especially if you want to extend your living space to out-of-doors. You don’t have to go big or pay a lot of money. 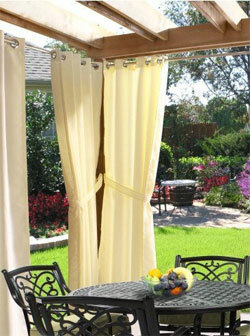 In fact, you may already have some weatherproof items that can personalize your space. Hint: they don’t necessarily need to be wall decor to be hung on a wall. Find out how wall art can boost a home’s value. Next up: curtains. Many people don’t even think about using curtains outside for ambiance. Of course, they can help with privacy and shade, but even when pulled back, they can make an outdoor patio feel like an interior room. 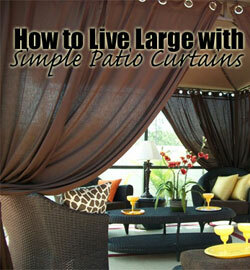 Find out how to create elegant outdoor rooms with simple patio curtains. 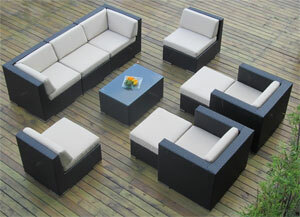 And don’t forget sound when creating outdoor rooms! Listening to trickling water can be extremely relaxing and take the ambiance of your outdoor space to a whole new dimension. Contrary to popular belief, you don’t have to spend a lot of money here. 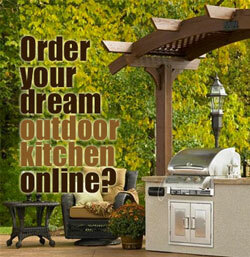 There are televisions and movie screens designed specifically for the outdoors. Whether you want a permanent fixture or a moveable structure, there are plenty of options.